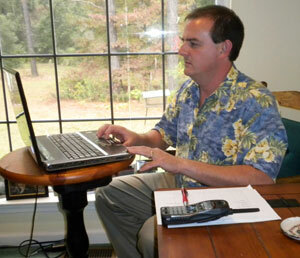 Pharmacist Dwayne Ragan provides remote pharmacy services from his home in Clyo, Georgia, to three critical access hospitals and one PPS (Prospective Payment System) hospital in Georgia. When Ann Fagan Cook took over as administrator of Parkview Hospital in Wheeler, Texas, seven years ago, patient medication errors at the 16-bed critical access hospital (CAH) averaged about 4 percent. 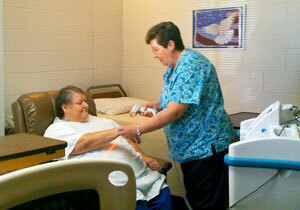 Nurses at the CAH dispensed medications to patients, and a traveling pharmacist was on-site only eight hours a week. Seeing the need for finding new ways to bring pharmacy services to rural providers, Moore created Remote Pharmacist Services (RPS), a private business, three years ago. Moore and other pharmacists review pharmacy inventories, check all orders, and provide therapeutic interventions before a medication is dispensed to patients in the hospitals RPS serves in Oklahoma, Georgia and Texas. Susan Huckert, a pharmacy technician at Parkview Hospital in Wheeler, Texas, uses a bar coder to identify Katie Gallardo. If the bar code doesn’t match the patient’s identify, the card holding the patient’s medications will not open. At a time when small facilities are already grappling with workforce issues related to the lack of pharmacists on staff or in the community, Moore said that several health care quality oversight groups, including the Joint Commission on Accreditation of Hospital Organizations (JCAHO), are demanding greater oversight of the medication distribution process by pharmacists to reduce medication errors. To learn more about RPS, contact Moore at ruralrx@att.net. Information, resources and frequently asked questions related to providing pharmacy services and access to prescription medications in rural communities. Information and frequently asked questions on physicians, midlevel practitioners, pharmacy and dental health care providers for rural communities. This entry was posted in Features and tagged Critical Access Hospitals, Georgia, Healthcare quality, Healthcare workforce, Hospitals, Oklahoma, Pharmacy and prescription drugs, Pharmacy workforce, Texas on November 24, 2009 by Rural Health Information Hub.